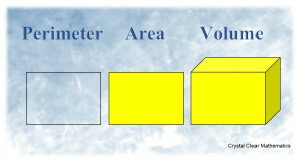 Some of the most common and useful forms of measurement are those devoted to length, area and volume (and capacity). We use them when calculating how far to walk or drive, the area that we may need to paint or pave or mow, and the volume of something to order, drink or use. The perimeter is simply the distance around a shape (or an object). The term comes from the Greek περίμετρος ‎meaning to measure around (something). The Greek περί means around, and μετρον means measure … very simple! Unfortunately, this does not always mean that we actually measure around something, however. There are occasions when we must calculate the distance because we cannot physically cirumnavigate the object or because the calculation will be much more convenient. This means that we must rely on geometry and some basic theorems and formulae about shapes. The two that you will use most often at school will be Pythagoras’ Theorem to calculate the length of diagonal or slanted lines, and the formula for the circumference of a circle when there is an arc involved. Areas are calculated according to some unit area (a square metre is very common). There are a range of formulae that help us calculate the areas for common shapes. They are all related to the area of a rectangle which we find using the formula A = lb. 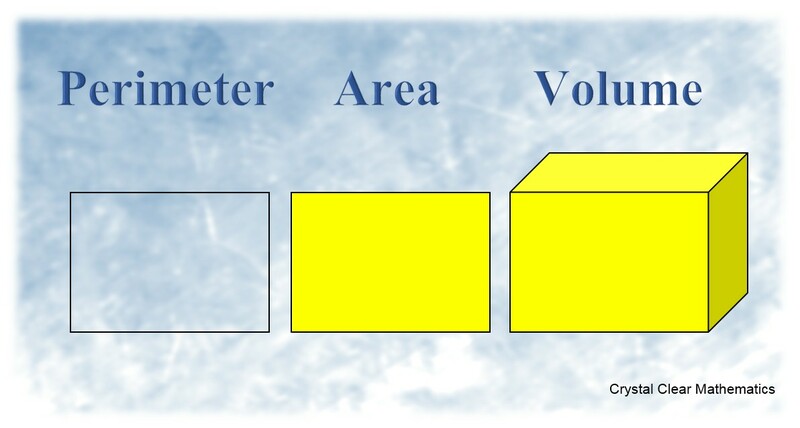 There are three groups of solids that you will need to know about in order to calculate their volumes. Prisms are composed of flat surfaces with two key surfaces being parallel and congruent (having the same shape and size). Prisms have the same cross-section the entire way through. Their areas are calculated very simply. Once you know the area of the end (cross-section, or base), the volume is found by multiplying this by the height of the prism, i.e. V = Ah. Pyramids are composed of flat surfaces also. They have a base shape and the remaining sides all converge on a point. The fascinating thing is that the volume of any prism is always exactly 1/3 of the volume of the prism with the same base and height! This makes the formula very simple indeed. If the volume of the prism is V = Ah, then the volume for the pyramid is V = Ah/3! Volumes based on circles (or ellipses). Technically a cylinder is not a prism because its surfaces are not all planes, but it bears a strong resemblance to a prism and the same volume formula (V = Ah) is used. Since we calculate the area of the circle on its end/base using A = πr², its volume is calculated using V = πr²h. Similarly, a cone is not a pyramid, but its volume is 1/3 that of the cylinder, so V = πr²h/3. The volume of a sphere is calculated using V = 4πr³/3. On these pages I will also be discussing ellipses. Their areas are found using the simple formula V = πab, but more on that later! This video shares astounding material! We all know that air has mass and that when it moves (cyclones, hurricanes, tornadoes) it can do great damage. But, have you stopped to think seriously about how much mass is in a certain volume of air? I am sitting in a room that is about 8m x 4m x 3m. The temperature is about 20°C. Using the same information that I share in this video, I calculate that the air in my room weighs about 115.2 kg. That means that it weighs more than I do! If I could construct a weightless box the size of my room and pump all the air out, it could lift me off the ground! That is, it would displace 115.2 kg of air and the surrounding air, in trying to push in the fill the vacuum, would force the box (and me) upwards. This is why hot air balloons "fly" and why blimps and dirigibles were built ... and why Zeppelins like the Hindenburg and Graf Zeppelin were constructed and flown. Would you be interested in taking a few days to fly halfway around the world at low altitude (the scenic trip) instead of completing the trip in less than 24 hours at high altitude? There are companies today experimenting with reviving the days of those great airships. Let's use some very simple mathematics to calculate the mass of air that surrounds the Eiffel Tower in Paris. We construct a box and calculate its volume. A cubic metre of air at 20°C weighs about 1.20 kg. When we calculate the mass of air that surrounds the Eiffel Tower and compare it with the mass of the tower itself, the result may astonish you! I hope you enjoy the video and that it provokes you to think about the forces in nature. My thanks to MarkTheGr8 at DeviantArt for providing such a wonderful image of the Eiffel Tower. The image I used in this video was significantly cropped. You may enjoy the original (and other great images from Mark) here. If you would like to see a little of what the Graf Zeppelin was like, this 9:10 video contains some impressive footage. It is difficult to comprehend the length of this vessel as it was about the length of three football fields! And this 10:15 video opens with the Graf Zeppelin flying over Wembley Stadium.